Every child wants to be more grown-up and what could give a child a better sense of being responsible and grown-up than driving their own car? Power Wheels are now making the driving experience much more real for youngsters everywhere, with their real-looking vehicles and the driving experience itself, not to mention firing up their imaginations as they head out into the world in their own car on a great adventure. No longer do kids have to play with plastic cars that they push along with their feet, or pedals. These battery-operated vehicles let children drive using start buttons and brake pedals, just like mom and dad do. There are so many choices that there is certainly one for every child whether they like Frozen or Batman, whether they prefer to drive solo or take a friend along for the ride, Power Wheels are sure to give your child hours of fun and entertainment. 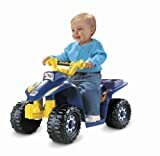 What Are The Best Power Wheels For Off Road And Rough Terrain? 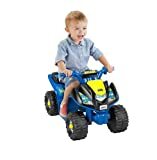 What to look for in power wheel? There are a number of factors to consider when choosing the right Power Wheels for your child, not only to make sure you get value for your money, but also that your child gets the safest and most fun experience while driving. The first thing is to buy a vehicle which is appropriate to your child’s age as some are designed only for children over 3, while others are aimed at toddlers; make sure you buy one that’s right for your child for safety reasons but also to avoid disappointment when it arrives. Secondly, decide if it is going to be a vehicle for your child only, or do they have a sibling who will be jealous and cause issues, in which case you might want to get a vehicle which can seat two children at the same time, because not all of them do. If your child is a bit of a daredevil, make sure the Power Wheels model you choose features a parent-controlled speed lock so that you can control the speed at which they drive, certainly when they first start using the vehicle. Also, don’t forget to buy a helmet for your child as the vehicles do not come with these included and it’s safest to get your child’s head properly measured to make sure it correctly fits for the best protection. Look at the size of the vehicle as well, as it might say it’s suitable for your child’s age. However, if your child is particularly tall, or short for their age, then take this into account before committing to purchasing one as you don’t want them to end up disappointed, or in a vehicle which they can’t handle and can’t manage to drive on their own. Also, think about your own DIY ability as some of the vehicles require assembling at home, which can be a challenge if you are technically challenged as a parent! It might be something to consider, particularly if you are buying it as a surprise for Christmas Day—you might need to put it all together beforehand rather than having a really stressful Christmas morning. And on that note, remember that you might well need to charge it up for 18-24 hours before the first use, so a bit of forward planning might be needed to avoid disappointment when getting it out of the box on the big day. Finally, look at the battery life, as there is nothing more upsetting for a child than to have to interrupt their fun to put the batteries on charge; make sure you choose one with a powerful enough voltage that it will have energy to keep going for as long as your child needs, and perhaps invest in some spare batteries to use, while the others are charging up. This John Deere Ground Force Tractor and Trailer is an ideal outside toy for children aged 2 to 7, with its realistic-looking tractor and large useable trailer. The added bonus of this particular model is it has a built-in FM radio so kids can listen to music while they drive, just like mom and dad do! It has two speeds as well as reverse, but parents are able to control the speed with a lock feature on second gear so they can’t take off down the road at full pelt! The tractor and trailer are very easy to drive with automatic brakes and huge wheels, making it fun for all youngsters who will love its realistic appearance. The Power Wheels Batman Lil Quad is a great purchase for Batman mini-fans, giving toddlers the chance to experience their own super hero adventures in the safety of their own back yard. Their imaginations can run away with them, as the vehicle can’t, due to its safe speed-limiting feature. The Batman colors and graphics mean this vehicle is guaranteed to be a hit with your child if they are a fan of the super hero; there is even a secret hiding place for them to keep all their super hero equipment inside the car. It is incredibly toddler friendly in its design, with a rugged, study feel and it is low enough to the ground for very young toddlers to climb in and out of it easily, and unaided. It will not only allow them to drive round and use their imaginations, but they will be learning balance, and cognitive skills as they drive it as well, and work out what happens when you press the buttons. With the Frozen colors and graphics, this Jeep is bound to be a hit with your little one, and with a mock radio that plays songs from the film, they will be in their element. With a passenger seat, this Jeep even lets them take a friend for a drive so they can pretend to be Anna and Elsa on a great adventure, in the safety of the yard. The Jeep has a back storage area to keep all their favorite Frozen mementos and secret belongings. It has smooth rounded edges for added safety and the doors easily open and close for quick access. There is a safety stop at 2. 5 miles per hour but you can take the speed lock off as they get older and more daring, with a speed of up to 5 MPH going forward, when they are ready. The vehicle has a sturdy steel frame and can carry up to around 130 lbs in weight. It helps children to learn cause and effect as they can use the wheel to steer the car themselves and go both backwards and forwards. The doors open and close just like a real car, and it will really drive their imagination. 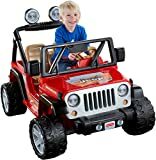 This Power Wheels vehicle has been designed to look like a real Jeep with its roll bars and distinctive front grill. It will allow youngsters to use their imaginations and picture themselves on a rough terrain or riding across a dessert, in the safety of their own yard. It has wide-designed tires which help it to cross any kind of surface, and there is room for two children to sit up front so no need to fight over whose turn it is to ride in the car. The Jeep allows the youngsters to drive backwards and forwards, steer, stop and start, and it automatically stops when they take their foot off the pedals. It has two speed options: 2.5 mph for beginners or 5 mph for the more adventurous and perhaps older children; parents can control the speed lock for safety reassurance. It is easy to drive and teaches children motor skills as they pretend they are driving up a mountainside. This Hot Wheels, with its realistic Kawasaki design, will really appeal to a child’s imagination as they tear up the terrain and imagine themselves driving up mountainsides. It features a Monster Traction drive system which enables it to power easily across all terrains including gravel, wet grass and mud. It even includes a twist throttle to rev it up into high speed, although it can only go up to 5 MPH! There is a lock out for parents to cap the speed at 2.5 MPH, and it also includes power-lock brakes for added safety. This Hot Wheels can go forwards and backwards and is suitable for children over 3. It has a weight limit of 65 lbs. The Hot Wheels graphics will appeal to all youngsters, not to mention the chrome accents for added flash appeal. The realistic vehicle will help your child learn independence as they drive themselves forward, backwards and steer, learning to balance and be aware of their feet and hands as they control their Power Wheels themselves. Kids will love this mini-version of a dirt bike as a first introduction to motocross. It provides a fun way for younger children to start their off-roading experience and can go up to around 12 MPH with no pedaling needed. This bike is suitable for children aged over 13. It features large tires, has a hand-operated back brake and works with a chain-driven motor. The throttle is twist-controlled and it is a quiet electric bike with a battery, perfect for starting their off-road experiences safely. 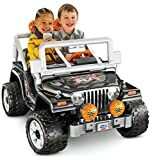 This Jeep includes a microphone with fun sound effects and a special speaker to amplify your children’s voices to give them even more fun and ways to use their imagination while driving around in the great outdoors. The pretend radio also features a number of songs, just like a real car. There is a back storage space to keep all of their adventuring materials and the vehicle can be driven over most terrains. It has a parent speed lock limiting it to 2.5 MPH, or it can increase to 5 MPH when the children are used to it and feeling a little more adventurous. This vehicle is suitable for children aged over three and can hold up to 130 lbs. in weight. There is plenty of room inside for two children to drive together. This Power Wheels offers an exciting off-road driving experience with a speed of up to 3.5 MPH and can go both forwards and backwards. It has an automatic stop mechanism as soon as your child takes their foot off the pedal, for added safety. It is built from sturdy hard-wearing plastic and can carry up to 69 lbs. in weight. This model also has extra-wide tires to grip on any terrain, including grass and concrete. The truck provides great storage for youngsters to take all of their important toys along for the ride with them, and its realistic appearance will fire their off-roading imagination. This little quad bike has been designed for younger toddlers and it suitable for children aged 1-3, with a weight limit of 40 lbs. It has built-in foot rests for added comfort and a really easy push button to make it stop or go. Set low to the ground, it is easy for young children to climb on and off by themselves. It has a cargo rack at the back to let children take their favorite toys with them for the ride on their adventures. It is powered by a 6-volt battery and the deep-tread tires mean it works just as well on hard surfaces and grass so perfect for playing out in the yard. For safety, it only goes forwards, and has a maximum speed of 2 MPH. The realistic styling means your toddler will feel all grown-up while independently driving, as well as improving their balance, and learning developmental skills as they figure out how to start, stop and drive all by themselves. This buggy vehicle is aimed at older children, aged 8 and upwards and can drive at speeds of around 8 MPH. It features a classic dune buggy style including the traditional bucket seats for a classic vintage look. It has a powerful motor and a weight limit of 120 lbs. The tires have extra grip and there is built-in suspension so dune racing will be amazingly fun. It can run for up to 40 minutes once fully charged, and the acceleration is controlled by a hand throttle. The back brake is also hand controlled for ease of driving. It is built from a durable steel frame and the sturdy bucket seat includes a seatbelt for added child safety when going up and down hills. The motor is fully electric, running on a battery so no need for any kind of fuel—just charge up and go. This little battery-powered quad has been designed with toddlers in mind and has a maximum speed limit of 2 MPH for added safety. It includes a large stop-and-start push button as well as built-in foot rests for little feet. The Kawasaki design gives it a grown-up feel, and it will drive safely across paving, tarmac and grass thanks to the broad tires. Some assembly is required for this product and children should never be left unsupervised while driving it. It has a sturdy broad base for extra stability but is low to the ground, making it easier for smaller adventurers to climb in and out of the vehicle independently. It is also only able to go forwards for extra toddler safety. This mini Ford Mustang will have them in raptures as it looks as good on the inside as it does on the outside with its spoiler on the back and fog lamps. Once in the adjustable driver’s seat, your youngster can use a pretend key to start up their car, with real engine sounds and lit-up dashboard lights, just like a real car! They can enjoy tunes from the pretend radio while they drive, and take their friends along in the passenger seat. The vehicle has real attention to detail including a beeping horn, cup holders and sporty chrome wheels, for added authenticity. This Power Wheels vehicle has an indicator light to show when the battery needs charging, just like a real car’s petrol light. The seat can be adjusted for growing legs, and it can drive at either 2.5 MPH on the speed lock, or up to 5 MPH for more adventurous youngsters. The Mustang can go backwards and forwards for that real driving experience and it includes power-lock brakes for added safety. The interior has smooth and rounded edges for extra safety. The car can take two riders with a maximum weight of 130 lbs.